Chesty Morgan and I were seeing Beauty and the Beast, a show at the Pantages theater so we decided to grab a bite locally. Locally, meaning the skanky stretch of Hollywood Blvd which is mostly Hookah lounges, tattoo parlors and wig shops. I also feel this section of town is covered in a permanent layer of grime. Even Juicy Burger, which is a sorta/kinda trendy establishment with several locations has seemed to fallen into disrepair. I guess you can only have so many homeless people coming in looking for leftover fries before it starts to leave its mark. The employees seemed like they were just hanging out. Waiting for their shift to be over. While I didn’t have high hopes for the food, the burger was absolutely fantastic. 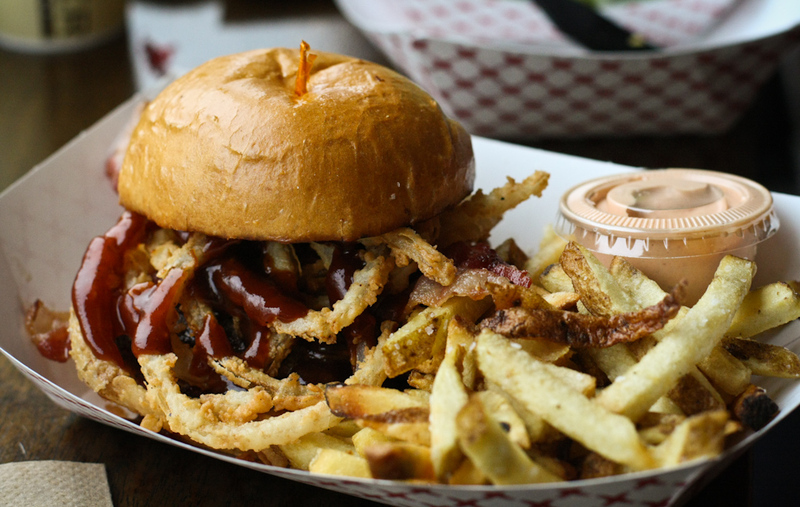 The beef patty was the perfect thickness, very juicy (as promised) and there were plenty of onion strings and bbq sauce to create the pefect Western ambiance. The fries, on the other hand? I think even a homeless person would have tossed them in the trash (probably spotting something more valuable underneath after throwing them away). They were hard and dry and had little black burn spots on them, like a drunk 1950’s housewife had angrily put her cigarette out on them. Like they had been very bad and needed to be punished. She had also perhaps dug the heel of her stiletto into a few. That didn’t stop me from chowing down on most of them. While I probably won’t be back again (unless I’m in the area, looking for crack) it wasn’t the worst experience ever and was kind of fun to tourist watch while I ate my delicious hamburger and shoved cigarette burned potato sticks into my mouth. 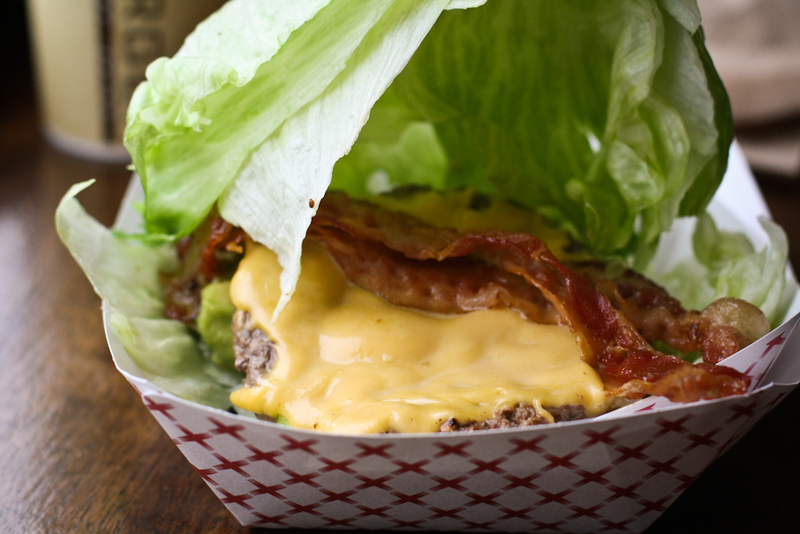 California Burger – Wrapped in Lettuce instead of Bun. Chesty’s on Atkins. Why didn’t you mention we were supposed to eat at some hot dog place but when we got there (after walking 3 miles) we discovered it was closed for the holiday weekend. And how I blamed you for not doing enough research. After reading Chesty’s comment, I’ve decided we need to incorporate a “like” system into these comments. Ha, totally forgot about our first dining attempt. A thousand apologies.